It happens. You’re going along, baking your bread – or, specifically, bagels in this case – and you just know something is amiss but you keep going because it’s not really feasible to halt the process when everything’s in progress, the oven’s on, the water’s boiling, the bread’s been proofing… There’s no turning back now! So I’m sick. No, not “sick” as in twisted (although some may well debate that), sick as in coughing and moaning and dragging my feet with a cold. A cold that hit big time just when the last bagel batch was nearing the end of the process. My head feels like it’s stuffed with cotton, my throat’s itchy and/or on fire. So I’ve slugged back a swig or two of cough syrup and now I’m zoning out. Everything’s a little askew, a bit off kilter, spinning somewhat and I’m losing track of things. I should have known better but I kept going. Bad idea. Somewhat. So eventually, I finish up and pull the bagels out of the oven and… oh dear. Yeah, go ahead and snicker. Compare these to the previous batch here for a real chuckle. It would have been better to just stop long before I got into baking them and tossed the dough out, saved some time and electricity. But no, I went ahead even though it seemed they hadn’t proofed quite enough, the fact they didn’t surface for a long time when dropped into the water was another clue they needed a lot more time and a fair hunk more care. But I was not feeling well, wanted to get this over with and go crash. The real bagel’s easily twice as tall as the puck. Geepers. Bah, I though, the dogs would like them for treats. So once they were cooled I cut one in half for each dog but had a bite of one first. OK, they flopped miserably (or tremendously?) 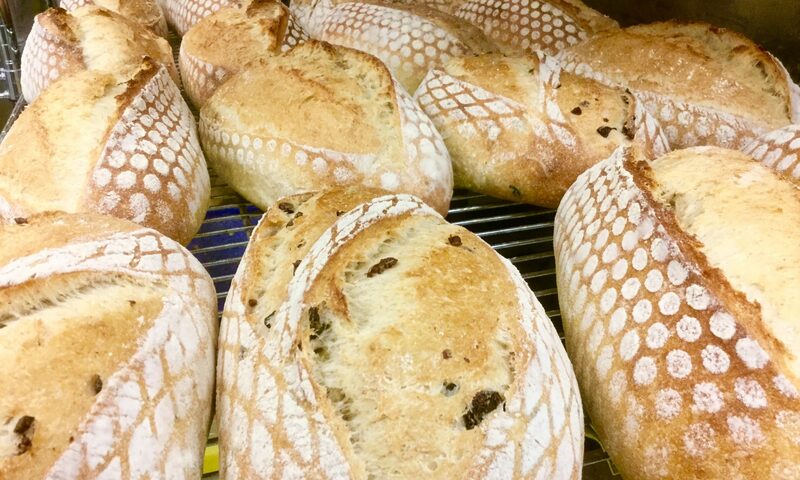 in the looks department, were decidedly on the dense and chewy side but, oh my, they taste really nice! So we’ll have some really hefty little flat breads for a bit. Sorry dogs, you’ll get some more in a few days since they’re not likely to go quite as fast as real bagels. Pretty simple: Don’t bake when your head is spinning and you can’t think straight! You could easily end up with a bunch of hockey pucks. But if you do, the results might be good for a laugh. And the bonus: even though the technique failed – or rather, I failed it – this shows the recipe is actually pretty darn good and produces a great tasting bread. Now I’m gonna go off and have some more Loopy Cough Syrup. See you once this dang cold’s done! Mine looked exactly like that and my head wasn’t even spinning! 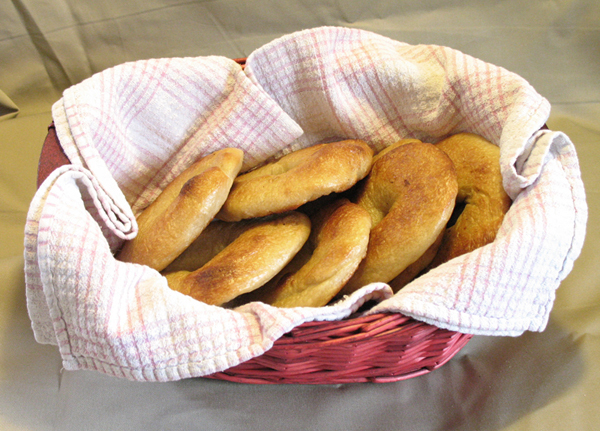 .-= Lien’s latest blog post: New challenge: baking my way through "Bread" =-.